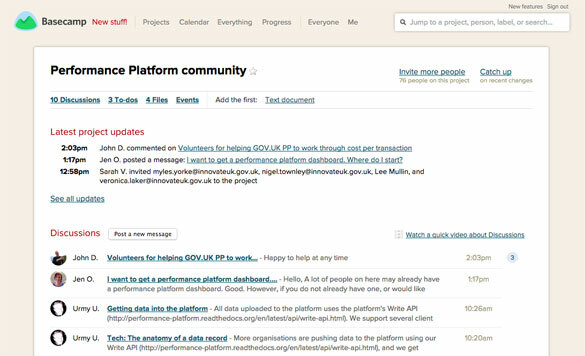 The Performance Platform now has a space on Basecamp to chat and swap notes. Our new community is for anyone in government with an interest in displaying performance data and acting on it. If you help to run a government service, please get in touch and we’ll send you an invite. We’ve set up the community in response to requests from you. Across government we’ve seen that colleagues want to share experiences about the Performance Platform. But since we’re located all over the country, it’s often hard to get people in a room. Now we have a virtual one. We’ve invited 40 people to join the community so far including colleagues from BIS, HMRC, DVLA, Companies House and Land Registry. Everyone on the Performance Platform team has joined too, so you can talk to our developers, designers, user researchers, business analysts, programme delivery manager and more. We’re keen to hear about the performance data issues you’re grappling with day to day. Please do get in touch and we’ll invite you to the Basecamp. This is my last post as Head of Engagement with the Performance Platform as I’ll be moving on to pastures new next week. It’s been a pleasure meeting so many of you. I wish you and your services the very best of British. For all enquiries about the Platform please continue to our performance-platform@digital.cabinet-office.gov.uk. You can also post below.